Private guards have been hired to man the rural home of National Super Alliance (Nasa) leader Raila Odinga in Bondo after the National Police Service withdrew officers it had posted there. This move comes barely two days after officers attached to Mr Odinga and those of his running mate Kalonzo Musyoka were withdrawn. The opposition leaders were stripped of their security following their decision to lead anti-IEBC demonstrations in Nairobi. According to Mr Boniface Oginga, a caretaker at Raila's Opoda Farm, all the four police officers who used to guard the home left on Tuesday evening. He said the officers, who acted under strict instructions, left in a huff, forcing the family to seek the services of a private security firm. "All I can say is that the officers left at around 3pm after a police vehicle came and asked all the officers to pack and leave. They left us dump-founded," said Mr Oginga. Siaya County Commissioner Josephine Onunga confirmed the withdrawal but could not comment further on the matter. "All I know is that they have been withdrawn, the duty of assigning guards to VIPs directly discharged by the Inspector-General," she said. Mr Odinga had earlier said that the GSU officers who were stationed at his home were taken to Nairobi for redeployment. He condemned the move, saying it was part of Jubilee administration's plot to cripple the opposition in its quest to push for a credible, transparent and verifiable repeat presidential election. 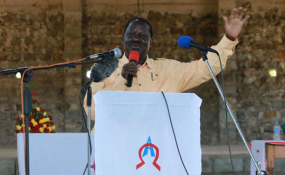 "It is sad that nobody had informed me of the withdrawal, I just woke up and found the officers recalled, I am not moved by the decision but I want to assure the government that my is the people of Kenya," said Mr Odinga at a press conference in Nairobi. It is not the first time Mr Odinga is being stripped of State security. He lost officers attached to him when he was the Minister for Energy after he led campaigns against the Bomas draft during constitutional amendment. Former Interior CS Joseph Nkaissery had initially threatened to withdraw the guards last year when Mr Odinga campaigned for the ouster of then IEBC Commissioners led by Isaack Hassan. But the decision was shelved after parties agreed to dialogue.